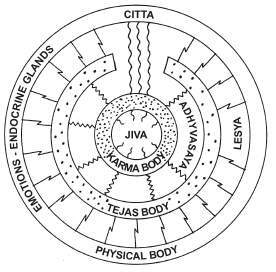 The causes in Jainism originate in times extending not only the current lifespan, but also all dualistic limits and single perspectives. The law of karma is immutable. In Jain view karma is seen as a most subtle body (karma sarira), consisting of subatomic small particles [those which mass is = 0 (zero), like photons etc.] in motion, which surround the soul more or less completely, limiting it's influence on our awareness. special type of material (pudgalikā) aggregates, belonging to Karma-varganā, (which are fit for being transferred into different varieties of karma, Karmavada) get attracted to the soul on account of its activity and ultimately get bound to it. After being bound to the soul, they give their effect as a result of which the soul undergoes the cycle of transmigration (birth and death); thus karma is a psycho-physical force keeping the soul in its mundane state;.Only after becoming totally free from karma, the soul can attain moksha (emancipation). It is a very subtle form of matter which plays the major role in deciding the future of the soul. It is also one of the five samavāyas, which have the cumulative effect in deciding the future of the soul. These most subtle particles are the result of materialisation processes caused by thoughts, spoken words, deeds and feelings in our actual and previous lifes. The existence of those karma particles cause mentality, causing thoughts causing words causing deeds causing feelings in the material world of our 5 sense organs. On each step from cause to effect there are feedback loops leading back to the karmic particles and by "feeding them", their potentiality (mass stays zero / energy level rises) gets amplifyed and their impact on our life increases. Purifying one's self (soul) means to stop feeding the karmic particles by not reacting (austerity measures) to thoughts, words, deeds, feelings on each level. Without feeding them they fade away. obscures the pure and perfect knowledge. obscures the pure and perfect intuition. holds up the self generated bliss and produces pleasures and pain, joy and grief in worldly life. produces delusion, meta physical and ethical. Prevents the innate ability of belief in truth. determines the biological species as well as the duration of life-span. embodies the bodyless soul and determines the diversities and individual traits. determines the status and family conditions.